In the last few weeks, I have started simultaneously teaching people how bitcoin works for the first time in the last decade and have been tearing apart the selfish mining fallacy. Many believe what has been said so far is the entirety of my argument against selfish mining. I will say it is a long way away from the complete argument on how bitcoin works and why selfish mining is a failed strategy. In this period of weeks, we have now seen people accept the concept of gamma being false. Later this week I will explain the concept of negative gamma and demonstrate how the selfish miner in sybilling the network, in fact, damages their propagation rate and success. For today, I am going to demonstrate an individual case. This post will detail the profitability of the 33% or one-third miner. According to the selfish mining paper even when gamma equals zero and ignoring the flawed mathematics that relies on independent processes that do not exist, I will demonstrate that this is not a viable strategy. The argument for selfish mining as it presently stands is based on the requirement of irrational and dumb miners. That is it. It is an argument for stupid investors who set machines running and do not care about their profitability. Selfish mining is simple to detect and block today without any change to the protocol. Miners within the small world graph that is bitcoin prioritise known mining nodes which they can see releasing blocks on a regular basis. It may be possible to anonymise an IP address, but to do so within the mining community leads you to a scenario where you are no longer incorporated into the white-list strategy used by miners. 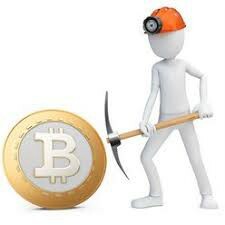 That is, the selfish miner seeking to hop and hide IP addresses deprioritises the communications with other miners. The result, more latency and a higher orphan rate for the selfish miner. I shall detail the mathematics of this process in later posts. Most arguments have already moved away from the concept proposed within the selfish mining paper. This was that rational miners will seek the selfish strategy to increase the revenue they would gain. I have demonstrated that within a short period the losses to selfish mining start to become large. In this post, I will demonstrate how even using the flawed mathematics within the selfish mining paper, a rational selfish miner confronted with stupid and profit ignorant honest miners would still choose not to attack the network using selfish mining. The argument for selfish mining has already moved away from profit-seeking and into attacks to damage the network. The entire purpose of the selfish mining paper was to argue that rational miners would engage in a rational strategy and the argument was that bitcoin is not incentive compatible. I have already demonstrated that where miners are rational the selfish mining strategy does not work. Today I shall demonstrate that even if honest miners are irrational and do not care for profit even then,the selfish mining strategy is defective and would not be deployed. The assumptions listed in the selfish mining paper are incredibly flawed. I will not cover all the errors in these assumptions today. I do not need to. Instead, I can use the model posited and demonstrate that even when this model used the selfish miner will own less (lower returns) using the strategy than when using an honest mining strategy. I will take this further and demonstrate that a miner seeking to attack the bitcoin network even to maximise the damage or take control would not deploy a selfish mining strategy. The selfish mining strategy states that when gamma zero it is practicable to attack the network using selfish mining from a one third hash rate or above. I will demonstrate that this is entirely false. The assumption I will make is that a selfish miner is somewhat rational. They do not need to be entirely rational but act in a manner that maximises their expected returns. That is, even should they wish to attack the network, they will do so using a method that maximises the expected results. If they are attacking the network, we would expect them to attack the network in such a way that allows them to obtain the maximum level of impact and hence lead to a more extensive set of gains than any other alternative strategy. If we take the view that honest miners can be downright mindless and irrational and do not care that they burn money for the sake of burning money and yet at the same time we have a rational attacker whose primary goal is control over bitcoin then we can still show that selfish mining is irrelevant. The result is, no rational attacker would choose to seek a selfish mining strategy over the honest strategy. I’ll say that again; the honest mining strategy is more effective than the selfish mining strategy even in attacking the bitcoin network. As such, the selfish mining strategy is fundamentally flawed before we even get into the errors in the model. I think that the assumption that even an attacker seeking to maximise the control over the bitcoin network would, if rational to any extent, seek the maximum returns. In this, if the rational attacker is seeking to maximise the number of blocks returned and not just to maximise profit, I will show that the selfish mining strategy is suboptimal when compared to the honest mining strategy. That is, the honest mining strategy will return more revenue in the form of blocks alone per unit of investment then the selfish mining fallacy will allow. I do not think it is too large a leap to have people accept that a rational attacker would seek the strategy that gives them the best results. I have assumed this minor assumption as the basis to discredit the selfish mining attack from the perspective of a semi-rational attacker let alone from the point of view and perspective of a rational economic agent. We cannot discount the cost to an attacker. It is not whether the attacker is rational, costs exist in any event. Earlier I demonstrated that the orphaning of blocks in the selfish mining strategy would lead to lower revenue. I will concentrate on the first month of costs (though this can be extended indefinitely) and demonstrate that the honest mining strategy can return a lower level of losses (greater overall returns) than the associated selfish mining strategy even assuming stupid and ignorant honest miners who completely ignore the actions of the selfish miner. In my simple model, I will take what is after all costs and assuming a static network for simplicity (as is done in the selfish mining paper) a higher than average net profit in the range of 7%. Net profit for most miners is far lower than this rate. In any industry, net profit of more than 3% is significant. In this, I am assuming a profit over the risk-free rate. At the time of writing bitcoin (BTC) as the dominant market fork is selling at USD 6950. In time I would expect BCH will exceed this rate. None of this matters in these calculations as profitability is reasonably independent of the fork. The same calculations can be applied no matter which fork we are referring. I will post the slightly messy Excel spreadsheet later tonight so people can play with the values. As with the majority of non-business people, we see those proponents of the selfish mining strategy focusing on the seen and ignore that incorporating the unseen. There’s a straightforward answer to the strategy, ask is it viable when compared to the alternatives. A typical flaw that many people take is to ignore the cost of a strategy. We have seen this in the selfish mining fallacy. It gets worse when we compare it to the alternative strategies that people do not consider. The simple consideration that must always be taken when comparing the viability of any strategy is to consider whether it is useful when compared to the existing strategy. In science, we compare the null hypothesis with the alternative hypothesis. This lack of rigour is a significant reason why the selfish mining fallacy was never science. The comparison is made merely saying how it is better than any other strategy without any analysis of even a default strategy. Better than what? Nothing is done within the Selfish mining fallacy to address this question. I will answer that here. The simple question is to ask is whether the selfish mining strategy is more effective than the honest mining strategy even when taken into an attack scenario. The goal of a selfish mining strategy is not saying I can do a selfish mining strategy. In the scenario where one seeks to maximise percentage for whatever reason including attacking the network, the goal is to find a strategy that maximises the amount as a percentage of blocks discovered for a given investment. This review is an essential factor. It seems to be something that many who claim to understand bitcoin do not understand. It is something that any rational finance person will grasp intuitively. Unfortunately, there are not many rational financial people or economists within bitcoin at the current time. It is straightforward; the selfish mining fallacy allows the selfish miner to gain a percentage position. The one-third selfish miner even taking the flaws of the model into account is expected to collect 44% of the non-orphaned blocks. As I said, we will assume stupid and irrational honest miners who do not care about the losses and who will not react to the attack for this paper. The simple argument is that the attacker for whatever reason seeks to maximise the number of blocks such that they can gain a 44% voting right or to capture long-term a number of the blocks that issued. Revenue, of course, is a time function that is ignored within the attack, but for this analysis, we will concentrate on the most effective manner that the 33% miner can deploy to achieve this percentage. This percentage is, of course, the limit gained by the selfish miner allowing for all of the flaws in the paper. Even for an attacker, we are in a world of economic constraints. Like it or not, all things come under economic forces. Even the so-called irrational actors including terrorists act under rational constraints. In our example, we are comparing the cost of completing an attack against the network using an idealised selfish mining scenario against the simple alternative of deploying more servers (ASICs) and buying the required hash rate. Run a selfish mining attack — the result is increasing the percentage of blocks found at the overall cost of a large number of orphaned blocks and a loss of revenue. Buy and deploy hardware and systems increasing the amount of hash rate compared to the rest of the network. I’m going to demonstrate that even in the simple model, the honest strategy is better. I will extend this to show that even when this is used as an attack, the honest strategy remains superior to any selfish mining mythology. Even at this point, and assuming selfish mining as an attack does nothing to impact market price, people are starting to grasp that the orphaning rate from the selfish mining attack increases significantly. 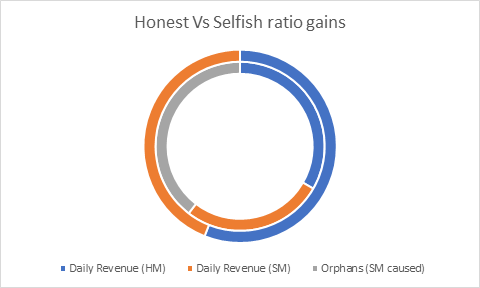 As I demonstrated in a prior post if the selfish miner causes many more blocks to be orphaned such that they can gain in a total percentage, the overall rate of return to the selfish miner will be less. The one-third selfish miner expects to earn 48 blocks per day. Under a selfish mining strategy that same miner may achieve 44% of the overall un-orphaned blocks, however, the resulting revenue returned is only in the order of 37 blocks per day. This eventuality is a net loss that needs to be accounted for in the overall returns. The selfish miner now has a lower revenue rate while also maintaining a cost structure that is higher than the default honest mining strategy. One significant aspect of the strategy that is hardly touched upon is the cost associated with selfish mining. Like many academics without any real-world grasp of economics or finance, the authors of the selfish mining fallacy have merely glossed over the costs associated with the so-called attack. This economic factor is in itself a significant flaw. Even ignoring the reactions of dumb and irrational honest miners, we need to assume that the potential selfish miner will consider the cost-benefit of any scenario. The end goal promoted in selfish mining is the increase of an overall percentage ratio capturing more of the earned blocks. To this end, the comparison of strategies is to compare the costs of an honest mining strategy that is used with the purchase of additional hash power to gain the same (Increased) percentage ratio when compared to that which would be achieved through a selfish mining strategy. In figure 1, we see the results in the initial month of a selfish mining strategy where the one-third miner manages to get 44% of the blocks that have not been orphaned. Again, and I need to emphasise this, we are assuming now dumb and irrational honest miners who ignore this loss. We have to state this point as any honest miner can detect selfish miner activity with a trivial amount of effort and decide merely to blacklist those servers. As stated above, honest miners whitelist other honest miners. Large miners are not hidden from each other. Merely blacklisting the IP addresses of the selfish miner is enough to obliterate this strategy, so it is essential to reinforce again that this potential scenario is against irrational and dumb nonreactive honest miners. Figure 2 displays the overall scenario in a much more straightforward format. 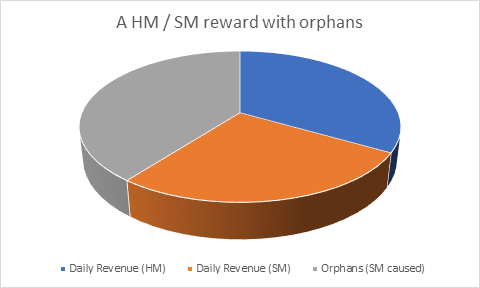 Here, the selfish mining strategy allows the selfish miner to increase the percentage of revenue but at a considerable cost in orphaned blocks. 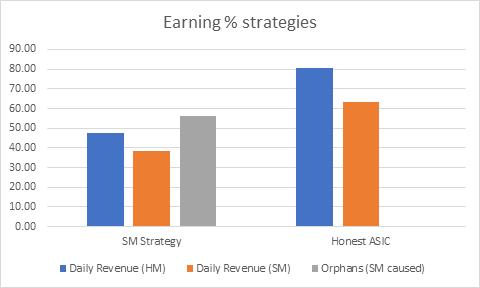 In the two strategies displayed in figure 2, we see the same percentages obtained, but the overall revenue is far more substantial in the honest strategy of purchasing additional hash power. When displayed in a doughnut graph we can see the increase in often rate significantly alters the overall returns for all parties. This result is significant. I’ve postulated in prior posts as the cost associated with the attack needs to be considered. The attack, if it can be called that, results in the first-month loss of -$25,537,188.16. The assumptions presented in this post are somewhat favourable for towards the selfish miner. We are assuming that they are productive and profitable than the honest miner. If they are not, the cost of the attack is far more extensive. What we see from this is that with the current bitcoin (BTC) price as a guide, the selfish miner would expect to lose over 25 million USD before any goalpost moving arguments of difficulty adjustments come to play. If the price of Bitcoin is higher, the cost of the attack increases proportionately. In a later post, I will demonstrate the following. Even after difficulty adjustments and ignoring financing costs and other overheads and assuming a static rate of mining over 12 month period, the most profitable selfish miner would not break even let alone make additional profit for over eight months. Moreover, if the miner is less profitable, this will take more than 24 months for a profit to be returned (if at all). I will further demonstrate in a later post that when a standard internal rate of return (IRR) for capital is applied that the attack never becomes profitable. The model in table 2 uses an extremely favourable set of assumptions for our selfish miner. The rate of leasing is set at a rather high 6.69% level for two-year hardware lifespan. The rate of electricity cost is slightly lower than standard residential (and more than most large miners pay), and the total costs for the purchase of additional hash rate exceed the amounts that anyone buying one Exa-hash would pay in reality. Consequently, the results are skewed in favour of the argument I am making and if the lower costs were attributed would make my argument even stronger. The end of this discussion is straightforward. The cost associated with purchasing hardware and systems on a monthly lease basis to move from 33% to around 44% of the overall hash rate (the gains claim to be achieved through selfish mining with dumb, honest miners) comes to an expected loss of under 22.5 million USD in the first month. The costs associated with the same percentage gain in selfish mining will come to an amount more than USD 25.5 million at the same time. This return is made assuming no market reaction and no reaction from honest miners who could (and shall) merely punish the selfish miner costing them immense amounts of revenue. To put this into perspective. It is USD 3 million more cost-effective to attack the network by honestly mining that it is to attempt to selfishly mine. The claim in selfish mining is that this is a valid attack. Even in this simple version where I do not incorporate the effects of honest miners seeking to protect their investment, we quickly see that the selfish mining strategy is incredibly ridiculous and would come at a far higher cost than merely buying additional hardware. The authors of the selfish mining fallacy want us to believe in its purest form that miners are complete dolts who will never react to an entity that seeks to cause them a loss in the short-term as well as to impact long-term profitability. The authors of the selfish mining paper seek to have us believe that an attacker who has the goal of increasing their percentage hash rate cares to do it in a manner that is simple to detect and stop. They want us to believe that an attacker will spend vast amounts of money achieving nothing when they can just purchase additional hardware and achieve the same results. There is just no way to argue that a selfish mining strategy with all the associated costs would be selected by anyone (even assuming the party has a malicious intent) over an honest mining strategy that gains the same results at a lower cost. Even attackers are bound by economics. If we take this to the extreme, we can argue that the strategy of the attacker is to gain more than 50% of the network. As has been shown for a single example, we now know that it is more cost-effective to buy additional hash rate. A 51% attack is of use only when it can be maintained. The problem with the selfish mining version of this attack is how quickly it can be detected allowing miners to effortlessly filter the offending blocks. It is in the rational interest of the honest miner to block selfish mining attacks, and it is inexpensive and straightforward for them to do this. If a selfish miner attacks the network, the reaction of honest miner’s and blocking these packets increases the honest miner’s revenue. They have a short-term possibility of up to 30 blocks per day in additional revenue that comes directly at the selfish miner’s expense. Any rational, honest miner will quickly block any attempt from the selfish miner, and they are incentivised to do so. This consequence is the other part of a potentially selfish miner extending their losses in the system. If a potentially selfish miner is willing to take significant losses to gain in percentage, they will also create the result of driving out the weakest honest miners who are unable to sustain the losses. Bitcoin is a competitive capitalist system. If one giant miner is willing to take significant losses, they are capable of increasing their hash rate more efficiently than many small miners who would become unprofitable. In fact, the addition of 8% more hash rate will lead to the 5% least profitable miners no longer being viable. In a simple linear system where no hash rate is incrementally added, it becomes no longer profitable to increase hash rate for the other miners. If the potentially selfish miner can achieve 44% of the hash rate at this sustained loss, they would be able to drive the lower profitability percentages of miners away from the system the result is that if this was the totality of the bitcoin system, the pure ability for the 33% miner to increase their mining hash rate to a level where they are now at 44% would drive out enough miners at the lower end of the scale to allow that potentially selfish miner to achieve 51 to 52% of the total network hash rate while not having to engage in a selfish mining strategy and for a lower cost than a selfish mining strategy could achieve. As such, there is no viable strategy that will lead to selfish mining. Even a quasi-rational attacker intent on damaging the bitcoin network needs to work within financial and economic constraints. The result is that even that attacker who can bear losses will seek to achieve their results while minimising the total level of loss sustained. Selfish mining will never exist for the simple fact that there are no economic gains that can be achieved through the strategy and in fact, the same end goals can be achieved using a far lower investment. In summary, the entire premise of the selfish mining paper is that a bunch of dolts sit running expensive computer equipment worth tens or hundreds of millions of dollars and at the same time are definitively too ignorant and care too little to react to an attack. The authors of the paper seek to defend their position not through rational discourse or the analysis of the results but rather through false authority and ridicule. The attack is not realistic in the most straightforward manner as it is less expensive to install and run a sufficient amount of hardware to achieve the gain in percentage hash rate without risk of loss or orphaning. For the 33% potential selfish miner seeking to achieve the touted result of 44% network control that the selfish miner paper claims, with present market rates and values it would be $3 million a month more cost-effective to directly buy additional hardware and run up enough hash power to achieve the 44% through an honest mining strategy which at the same time is not an attack and cannot be blocked. If the potential selfish miner is willing to sustain significant losses and has the capital to do so, they would be able to buy sufficient hardware to achieve an initial 44% network control while also driving the lowest tier of small miners into bankruptcy resulting in a network hash rate of 51 to 52%. It is never sufficient to look at an economic condition and event in isolation. This typical reaction of central planners leads to a maddeningly ignorant cry for changes to protocol and systems design without any understanding of the downstream effects that these may cause. The reality of the scenario is that there is no place for selfish mining. No sane individual or corporation would spend money for the sake of spending money when even given the direct goal of damaging the network; they could achieve this for far lower capital expense.